As hard is it might seem, Diddley Squat and Bupkes rose to the challenge of following their esteemed predecessor, Potus. And they did so by simply being themselves. 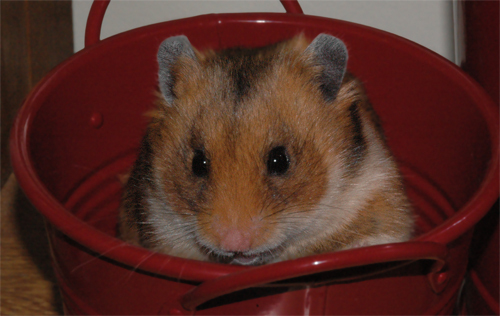 "Hamster family values" took center stage in the 2004 campaign, as Diddley and Bupkes ran a laid-back, easy campaign that led potential voters to see them as the real "nice guys" in the election. Donna and Cecil, the parents of the 2004 candidates. A bit of history is useful here. Diddley and Bupkes are the sons of Cecil and Donna. In the summer of 2004, Cecil, a direct descendant of Mister Ganja, advertised on this web site for a bride. 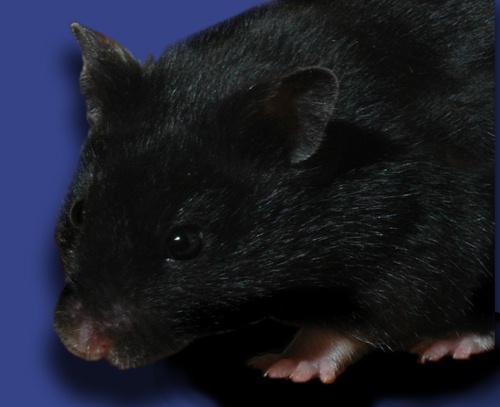 It took a while but soon he had one - a gorgeous little black female from another state. Donna was her name. She was picked up and driven home by the Great Furless One ("GFO") and it was love at first sight. 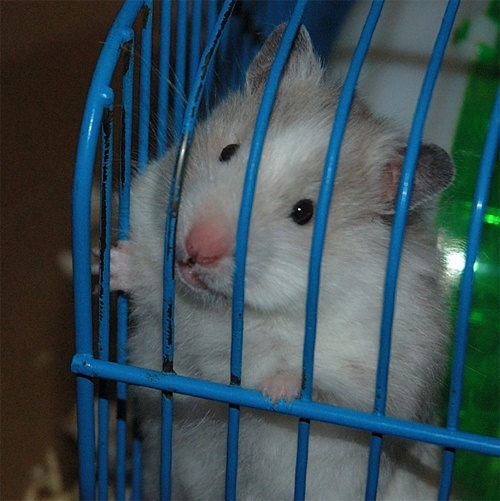 Within a day, Cecil was hanging around her cage kissing her through the bars. It would be a while before they married because she was then too young. Females shouldn't start families until they weigh at least 3.5 ounces. Young lovers: Donna and Cecil meet in August of 2004. 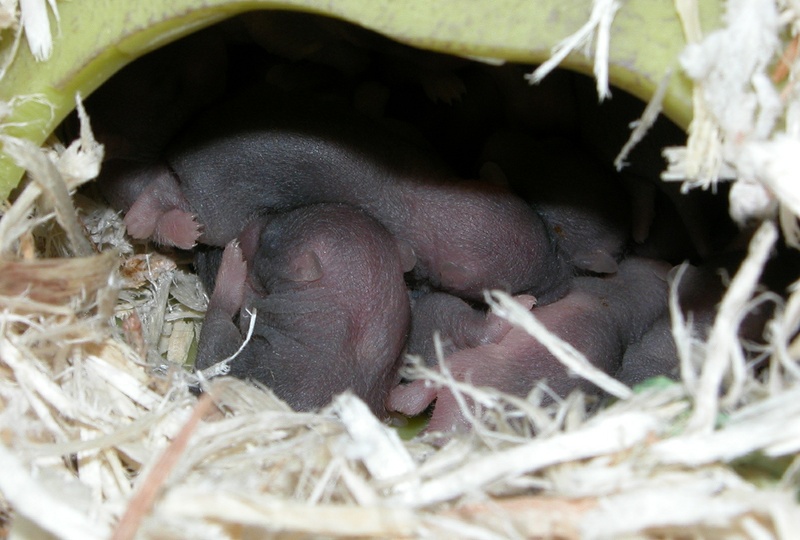 They married when Donna reached the appropriate size and on the moonlit night of 25 September 2004, she gave birth to a huge litter. 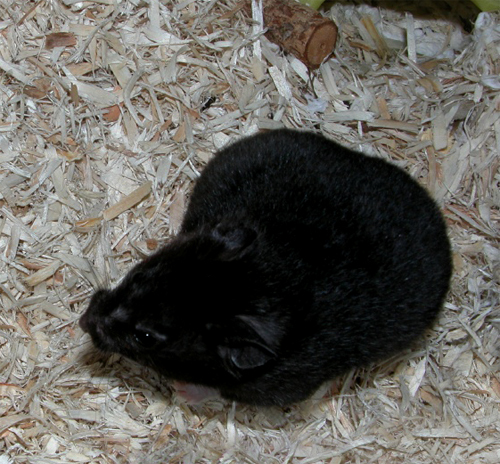 The photo shows Donna "very pregnant"
The candidates were born on the 25th of September 2004. Every detail of the candidates' lives was recorded for posterity, in keeping with the important role in American history young Diddley and Bupkes were destined to play. However, what isn't clear is how large the litter was. 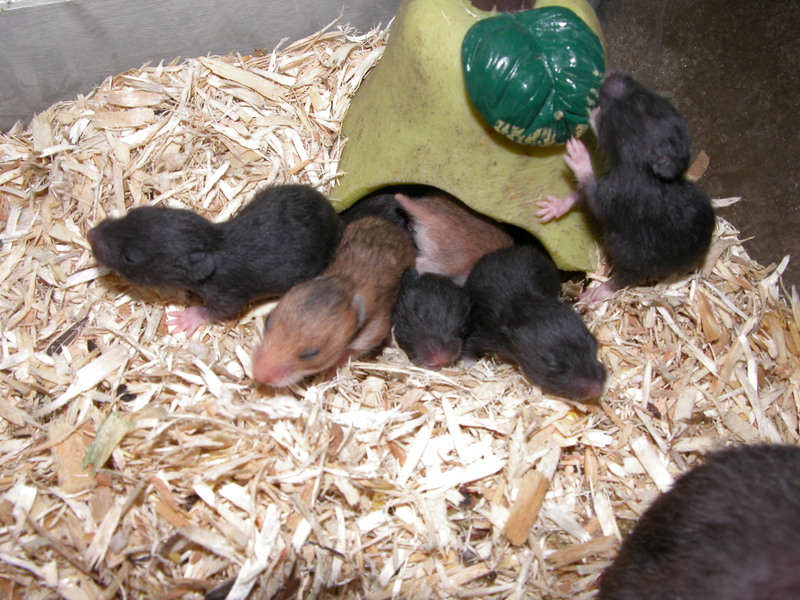 Fourteen survived to weaning age and it is known that at least two died in the first few days after birth, possibly three. 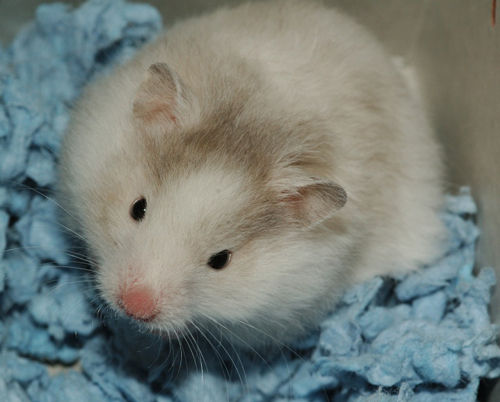 Seventeen is the number usually described as the largest known hamster litter. 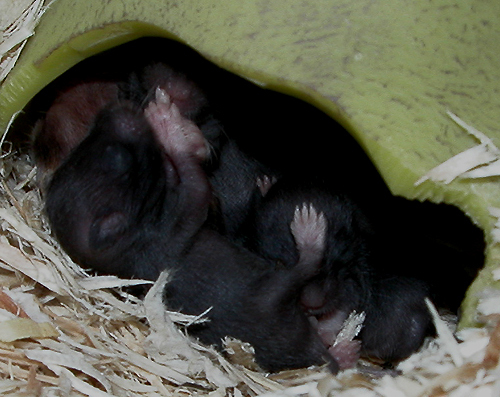 The infant candidates are four days old in this photo. Growing fast! 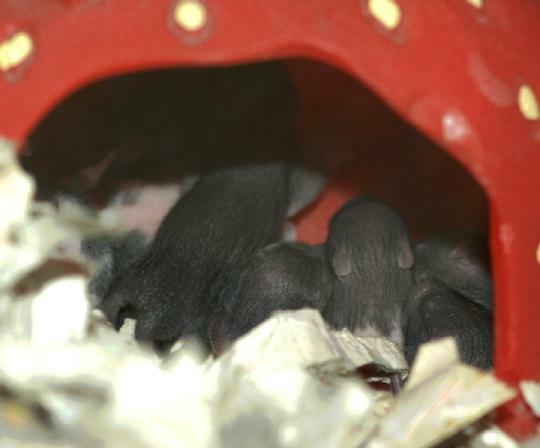 Here they are asleep aged nine days. At nine days they explore outside the nest. 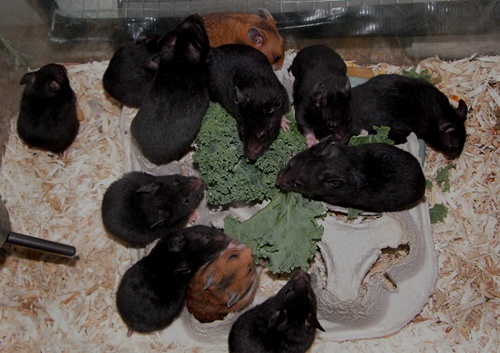 Two weeks: They are eating on their own but not weaned. 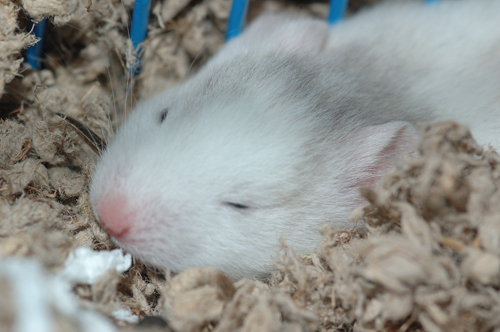 October 28th: The little hamsters are a month old. 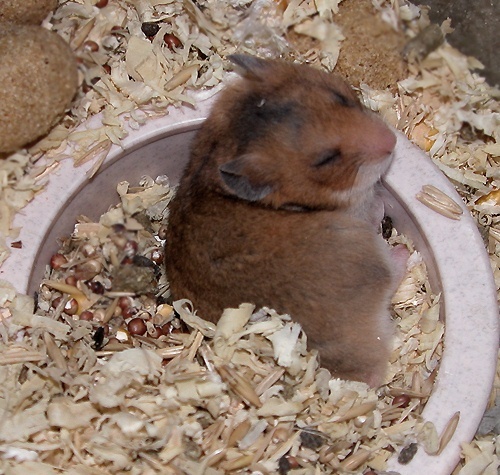 The candidates were soon living in their own cages as young adults and quickly grew into their roles as candidates for president and vice-president of the U.S.
A one-month-old Diddley Squat falls asleep in the food dish. 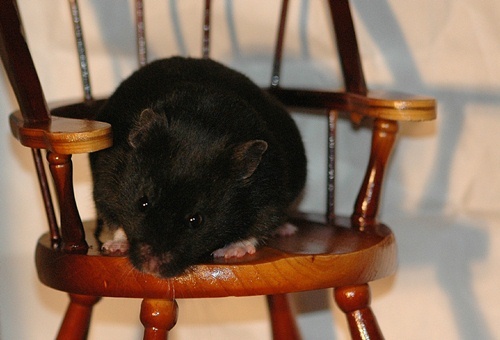 for a picture in a hamster-sized chair. ponders the issues facing voters. For the first few months Diddley and Bupkes concentrated on their studies, brushing up on all things political to prepare themselves. 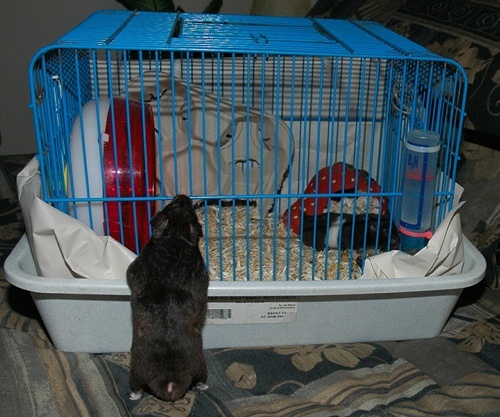 But they both realized that it takes more than brains to be a good candidate. It also takes heart. And both vowed to marry and have families. 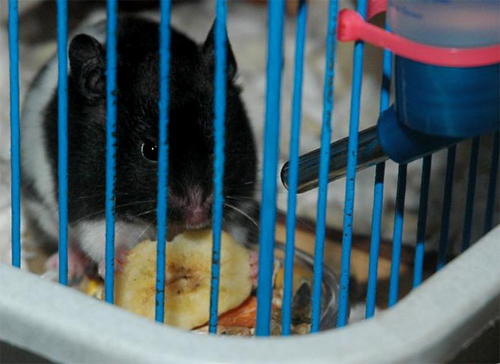 his marriage to sweet Lolly. 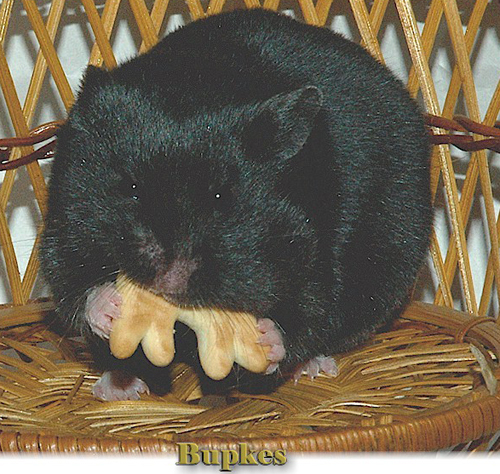 Bupkes was first to take that giant leap into holy matrimony, courting and soon marrying Fancy, a gorgeous black-and-white banded hamster. They married and, on the 13th of August 2005, became the proud parents of ten children, including two sons who remained in the household - Yarash and Cesar. 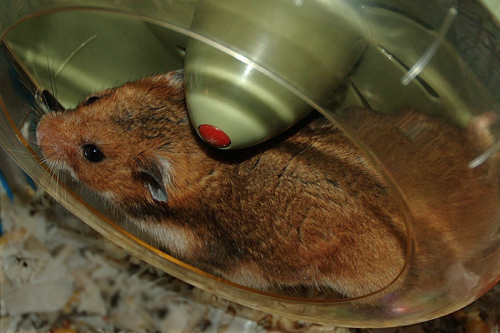 the girl hamster of his dreams. The young bride is shown again below. It would not be until February of 2006 that Diddley married his sweetheart, young Lolly, who had lived with the family from a very early age (1.6 ounces), arriving in December of 2005.
married Diddley the following February. 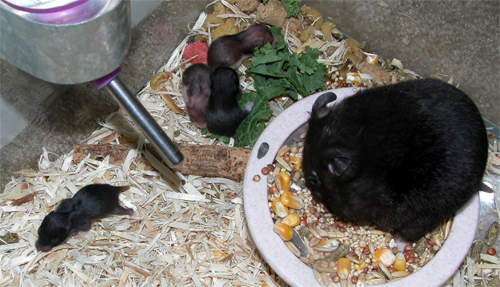 The marriage of Diddley Squat V and Lolly was rewarded with three sons and two daughers, born on the 9th of March, 2006. The daughters grew up to live in Virginia. The sons remained in the home of their parents. at Lolly and the five babies. 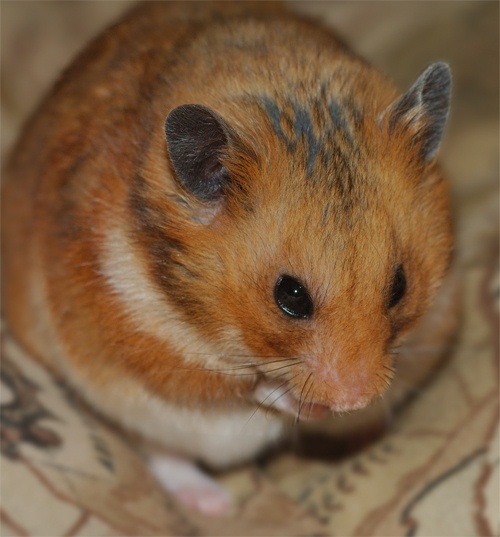 A distinct hamster smile is on his face. 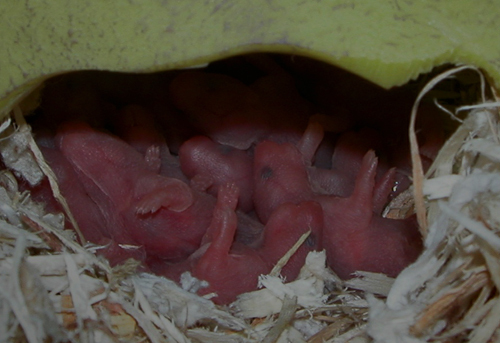 18 days after the birth of the litter. 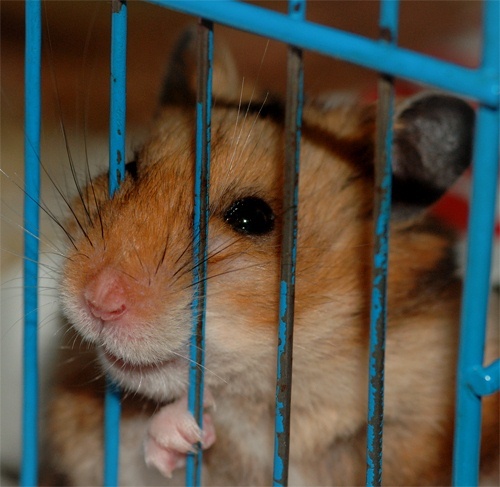 But both hamsters realized that in spite of their close family lives, there was a campaign to run. And in the spring of 2006, they assisted in the production of what was to become the most sophisticated campaign video yet. Like Potus's, it was professionally filmed and edited, but this one was nearly an hour in length. The video was produced in part by vice-presidential candidate Bupkes for the entertainment firm founded by his paternal grandfather, Yoda (father of Cecil). It gives ten different reasons why the voter should pick Diddley and Bupkes - everything from competence and integrity to finance and environment. It is hoped that the video in its entirety will soon be available to viewers via this website. an important part of their nights. The lives of the candidates focused on politics by day and family by night. 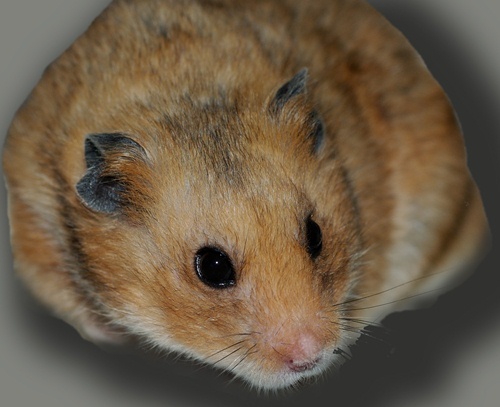 In fact, the two were intertwined as the extended family hoped to leave descendants willing to take over their roles in the Hamster For President movement. Bupkes and Fancy's son Yarash died tragically of an unknown illness on the 12th of December, 2005. He was a day short of four months old. Young Yarash had been named for Bupkes's great-great-great-grandfather, Yarash, Jr., running mate to Diddley Squat IV, and for his father and Bupkes's great-great-great-great-grandfather, the first Yarash. Meanwhile Cesar took a wife, Bama, and the generations continued. Diddley and Lolly's three sons were named Casey Dingo Squat, Rufus MacDuff Squat, and Yarash Squat (after his recently-deceased nephew). 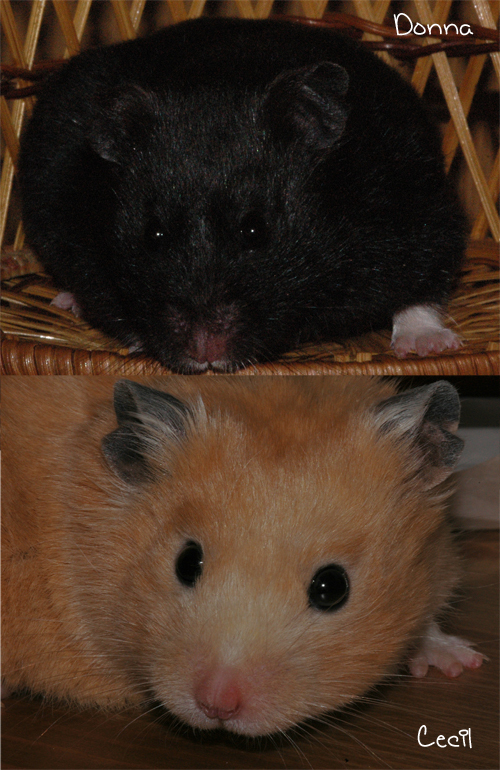 The three of them became the three longest-living hamsters in family history. Two daughters, Rum and Hemiette, moved to Virginia where they lived out their celibate lives in luxury. Cesar and Bama had two children, a daughter named D'Arcy and a son Louie, both living in Virginia. Diddley's son Yarash would eventually marry Yofah. And in the meantime, Louie married a Virginia bride named Noelle who came to the household after their honeymoon. Noelle bore Louie 14 children on the 21st of January, 2008. Eleven survived. Then on the 4th of April that year Yarash and Yofah's three daughters were born. Two of them would carry on the family tradition and take their places in history. 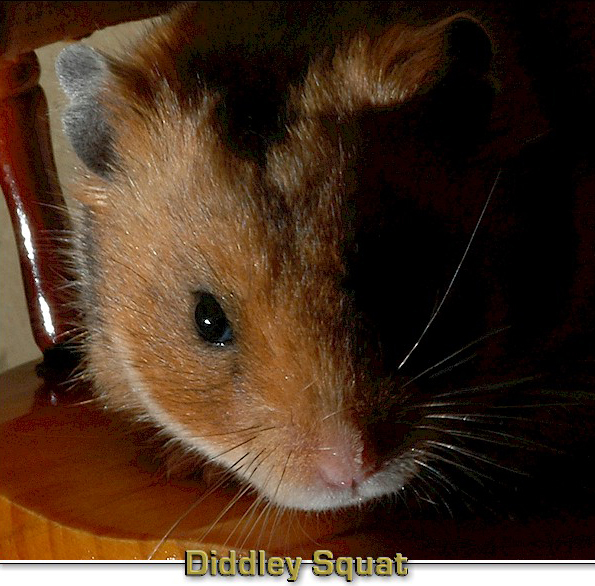 Diddley Squat died of heart failure on the 19th of October 2006. Bupkes passed away of old age overnight 16-17 February, 2007. 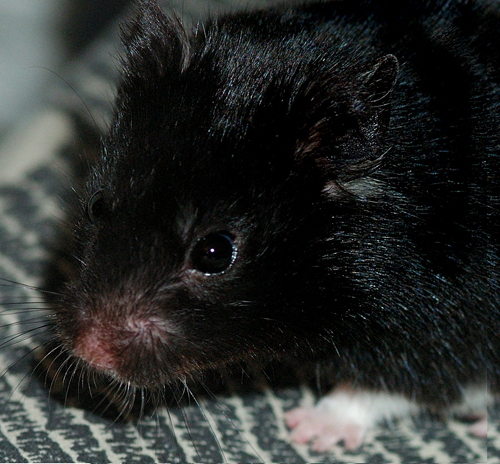 Cesar, son of Bupkes and Fancy. Official campaign portraits of Diddley Squat V and Bupkes.